The exquisite opera star, Ruth Ann Swenson, cast her delightful spell through the exquisite Weill Hall of the Green Music Center at Sonoma State University, yesterday, Sept. 29. Ms Swenson is a unique operatic artist. Her angelic voice is matched by her ability to embody a complete character in a song. She is ardent, bereaved, playful, flirtatious, prayerful, and even funny. In each, she is completely convincing. As this writer overheard, the audience was moved and deeply impressed. A music lover from New York commented, “I’ve never seen or heard a great opera singer so able to become a different role. Such an amazing range of theater plus great music.” Charles Calhoun, San Francisco’s distinguished choral director, commented, “She is such an artist. I am amazed at her gift to become these different characters, project different emotions.” Ms Swenson was accompanied by pianist Warren Jones. Mr. Jones demonstrated not only his sensitivity to the singer, but also his own musicianship. He performed Three Pieces from Op. 118, by Brahms, and three mazurkas, thought to be the last music written by Chopin. In both, Mr. Jones’ playing was a bonus gift to the audience. Greatly skilled; he plays with understanding of the music. He becomes a perfect partner for the composer as he is for the singer. Ms Swenson’s program opened with Bellini’s Il fervido desiderio/The Fervent Wish. She immediately captivated everyone with this declaration of love. Her selections from Verdi let the audience know that they must be prepared to experience all of life in a few minutes. She sang Verdi’s La Seduzione/The Seduction, a story of cruelty and grief. Stornello/Refrain posed an opposite tale of love, “Constancy of love is foolish…I’m fickle and I flaunt it!” The program had beautiful surprises. This writer had never heard Ms Swenson sing Richard Strauss. Her three selections by this great composer for sopranos were magnificent. Allerseelen/All Souls’ Day, nostalgic and lovely, Breit’uber mein Haupt, full of sensuous longing “I want only the darkness of your raven locks, and the radiance of your gaze,” and Zueignung, a stirring declaration of dedication. The necessary brevity of an online posting prevents longer descriptions of the astonishing enactment of Mozart’s Quanti mi siete intorno… Padre, germani, addio from Idomeneo. “How many of you ruthless murderers surround me?” Or the refined, alluring L’heure exquise, by Reynaldo Hahn. Now it is time for a confession. This writer has long had an allergic response to opera divas singing American popular songs. Great big voices singing something that Hoagy Carmichael or Cole Porter wrote for something entirely different normally does not work. Not good for the song. Not good for the great big voice. It was a revelation to hear Ms Swenson sing On Such A Night As This, by Barer/Martin; They Say That Falling In Love/My Romance by Berlin/Rodgers&Hart; Embraceable You by G & I Gershwin. Each had been arranged for Ms Swenson by Richard Riccardi. Each was a jewel. Her pristine diction brought out the wit and insight of the lyrics. Her beautiful voice, matched perfectly to the arrangements, revealed the beauty of these musical treasures. She sang them as Ruth Ann Swenson singing great songs (not as an opera star pretending to be Billie Holliday). Good for the songs, good for the singer, S’Wonderful! for the audience. She gave more of herself in Somewhere Over The Rainbow, her encore. Ms Swenson will offer classes at Sonoma State. One must hope that the powers that be at the Weill Hall, Green Music Center, bring her back to perform again. And again. Her career began at the San Francisco Opera. For many years she sang at the Met, in New York, and at the great operas around the world. While she is near, let’s celebrate her magnificent gifts. Hear Ruth Ann Swenson and Warren Jones on the recording i carry your heart, EMI Classics. 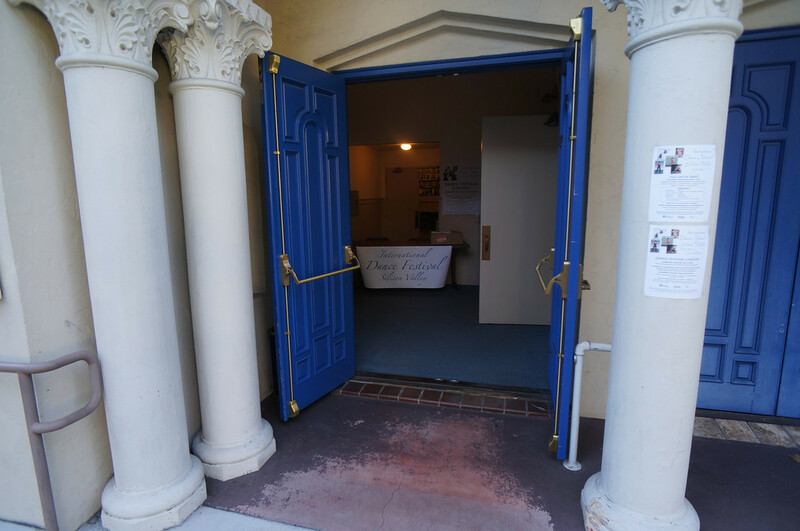 This entry was posted in Hedgehog Highlights and tagged music, opera, Ruth Ann Swenson, Sonoma, Weill Hall on September 30, 2013 by Leslie. Yefim Bronfman performed Tchaikovsky’s Piano Concerto No. 1 with the San Francisco Symphony, September 14, 2013. My eyes open wide and I shake my head; I am startled by my good luck to have been there. Please do not listen to anyone who belittles Tchaikovsky. There are those who will do it because too many others like his music. Do not listen to that noise, listen to Tchaikovsky. Mr. Bronfman played with power, grace, and understanding. He played delicately. He played so fast that I could not believe anyone’s fingers could move that way. He created a musical world. The SF Symphony met his need for a great partner in building this world. I want to say it was monumental; it was, but that word does not express the movement and life in the music. Mr. Bronfman played it into life. It is music that does not suggest a story but brought me to tears. The magnificence of his performance filled the hall with love, desperation, exaltation, with Tchaikovsky. The SF Symphony’s Music Director, Michael Tilson Thomas’s programming brilliance put Prokofiev’s Third Symphony on the same concert, after intermission and a chance to catch one’s breath. The SF Symphony played it as an overwhelming musical experience. The symphony, premiered in 1929, is full of struggle. All of the instruments are engaged in the battle. Knowing that the Symphony has sources in Prokofiev’s opera, The Fiery Angel, it could be the absolute struggle between good and evil, but it is a symphony, not an opera. The music has jagged, stabbing sounds and a quieter theme for the horns. There is no relief; the instruments assert their desires. It is a devilish battle. Search Prokofiev on the internet. Under his picture the caption is “Ballet Composer.” It is another harsh irony pursuing Prokofiev through the new century. Yes, ballets and Peter and the Wolf, but also the depths of this fantastic, cruel, reality in his Third Symphony. Thinking about Tchaikovsky and Prokofiev, a line from W.H.Auden’s poem, In Memory of W.B. Yeats, comes to mind. “Mad Ireland hurt you into poetry.” Both Tchaikovsky and Prokofiev were set upon by Russian struggles. Was Tchaikovsky too Western to be accepted as a great Russian composer? Were Prokofiev’s operas elements of pre-Revolutionary decadence? The bureaucrats with guns as well as other composers shouted, “Yes!” Auden asked the poet “with your unconstraining voice/Still persuade us to rejoice;” that is what Tchaikovsky and Prokofiev both could do and did for music and for us. Auden won’t claim “rejoice” because all is well, but because they could write this music. This entry was posted in Hedgehog Highlights and tagged classical music, Fiery Angel, Michael Tilson Thomas, Piano Concerto No. 1, Prokofiev, Prokofiev's Third Symphony, San Francisco Symphony, Tchaikowsky, Yefim Bronfman on September 19, 2013 by Leslie. Ruth Ann Swenson will perform at Weill Hall of the Green Music Center, Sonoma, CA, Sept. 29. You still have time to get a plane ticket or jump in your car if you are not near Sonoma. Do not miss this opportunity. One of the loveliest places on the planet, Sonoma is about to rejoice in one of the loveliest voices ever heard. Ms Swenson’s recital is part of a line up of major stars whose performances celebrate the opening of this new, acoustically perfect venue. (Itzhak Perlman will be there on the 21st; Herbie Hancock on the 28th.) It was a privilege to be in Ms Swenson’s audience when she sang the role of Desdemona, June 22, 2013, at the Astoria Music Festival. This writer has long considered Verdi’s Otello to be THE opera. The performance in Astoria’s legendary Liberty Theater lifted us all to a new level of experience. Ruth Ann Swenson sings like an angel must sing: pure pitch, always effortless whether the heights of her soprano or the depths, exquisite clarity when the notes come quickly. Praying alone in her bedchamber, her Desdemona broke our hearts with her music at the same time she led us to experience more understanding through the music alone. 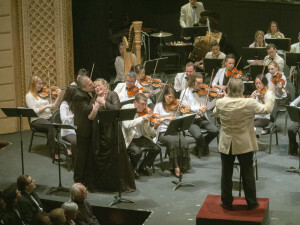 The Otello performance onstage in front of the orchestra was devised and conducted by Artistic Director Keith Clark. It was a masterful presentation, a proper way to recognize Verdi in his bicentennial year. 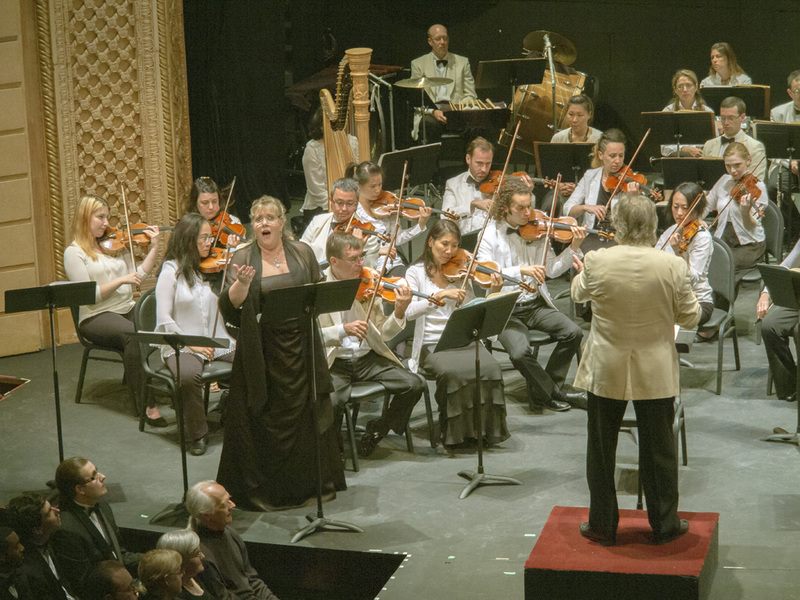 In addition to Maestro Clark’s Festival Orchestra, Ms Swenson was joined by the powerful performances of Allan Glassman as Otello, and Richard Zeller as Iago. Together they created an Otello that still pierces my heart just remembering it. On Sept. 29, Ms Swenson will sing music by Bellini, Verdi, Mozart, Handel, Berlin/Rodgers & Hart, Gershwin, Lehar. For ticket information call 866/955-6040. 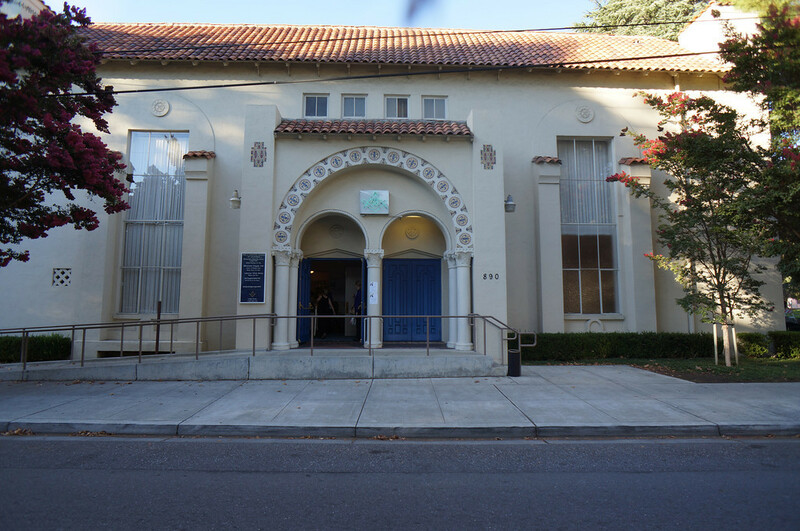 The Green Center: 1801 E. Cotati Ave., Rohnert Park, CA. Photos: (L to R) Ruth Ann Swenson as Desdemona, Keith Clark conducting; Alan Glassman as Otello; June 22, 2013, Astoria Music Festival. Photos by Jonathan Clark. This entry was posted in Hedgehog Highlights and tagged Allan Glassman, Astoria Music Festival, Green Music Center, Keith Clark, Otello, Richard Zeller, Ruth Ann Swenson, Sonoma State Music, Weill Hall on September 18, 2013 by Leslie. Where did the time go? I feel as though the Festival just ended a day or two ago. It’s Sept. 10. The Festival Concert was on August 25th, and what a tremendous program it was. A full house audience watched with obvious pleasure. The dances were beautiful, exhilarating, powerful, and even fun. The audience went outside to observe the Festival Dancers perform their site specific works in Pioneer Park, just adjacent to the Masonic Center. It was a beautiful day in the sun and under the big trees. Here are some pictures from rehearsals and performance day. If you missed the Festival this year, don’t let that happen again. Planning for Season number three begins now. It will be a great one. This is the Masonic Center: Dance Center for the Festival. 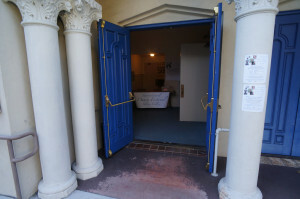 Here’s the entrance to the Festival Concert. The Festival Dancers performed Song of the Mountain, a premiere, dances in the park, and Little Cat, set to a Polish folk song. 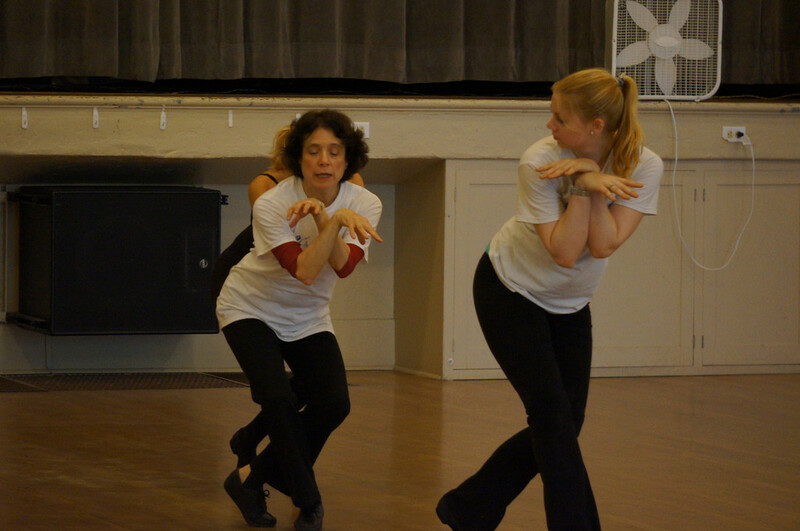 Here’s Leslie Friedman demonstrating how the Little Cats will take their bows. 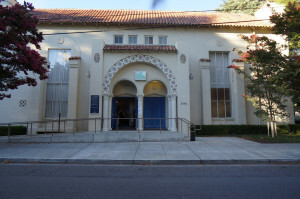 This entry was posted in INTERNATIONAL DANCE FESTIVAL-SILICON VALLEY and tagged Festival Dancers, Full Day of Dance, International Dance Festival-Silicon Valley, Mountain View CA, Mountain View Masonic Center, Pioneer Park, Summer Dance Festival on September 11, 2013 by Leslie.